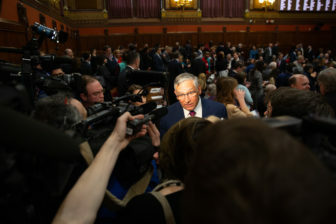 Senate Minority Leader Len Fasano, R-North Haven, ignited an angry exchange with the governor’s office Tuesday by saying Gov. 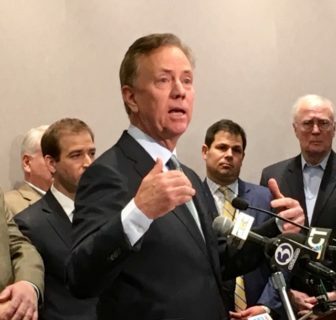 Ned Lamont’s “hands-off and silent approach” to legislating led to Democratic legislators watering down a public-private partnership bill to placate unions. The administration fired back 90 minutes later by noting Fasano also had a contentious relationship with former Gov. Dannel P. Malloy, comparing the Senate GOP leader to a “tiresome and predictable” heckler from the bleachers. The comments come within a few days of other Fasano-Lamont clashes over tolls and raises for two state employee bargaining units. The head of the Connecticut AFL-CIO, Salvatore Luciano, strongly criticized Lamont in March 25 testimony before the GAE committee, arguing an administration proposal would roll back vital anti-corruption safeguards built into the state’s contract award system in 2007. -The duration of such partnerships. The current limit is 50 years. -The kinds of projects that can be undertaken with the private sector. Currently they are limited to early child care, health, housing and transportation initiatives. Committee members rewrote the bill, adopting a measure that instead only raised the limit on public-private partnerships from five to seven. Fasano said the governor’s proposal “would have given life to public private partnerships and was the cornerstone of his economic development strategy” but now has been “torpedoed” and “neutered” with “worthless” substitute language. Lamont spokesman Rob Blanchard countered quickly Tuesday. Gov. Ned Lamont defending his tolls proposal. Republicans want to redirect other bonding — currently used for school construction, capital programs at state universities and economic development — for transportation. While administration officials suggested a compromise might be reached, Fasano said it would be difficult as long as the “toll monster” is any part of the plan. And one day before that, the Democrat-controlled legislature voted to approve an arbitration award that grants 5.5 percent raises, both this year and next, to two new bargaining units representing roughly 200 assistant attorneys general. The assistant AGs had not received raises in 10 of the previous 11 years. But with analysts warning state finances — unless adjusted — could run billions of dollars in deficit over the next two years, Republicans argued the raises simply are unaffordable. The administration said that while it respectfully disagreed with the arbitrator’s conclusions, “there is no guarantee another round of arbitration would produce a better result for the state” and that the decision ultimately rested with the legislature.